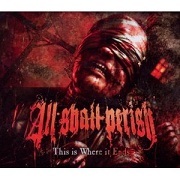 Review: "All Shall Perish: This is Where It Ends" - Sea of Tranquility - The Web Destination for Progressive Music! California's All Shall Perish are back with another platter of technical death metal & grind, this one called This is Where It Ends. The band has added a new guitarist and drummer, but they've not lost a step, as This is Where It Ends picks up right where Awaken the Dreamers left off. Though in spots this is as brutal and maniacal as metal gets, there's a surprising amount of melody to be found here, and as always the guitar work is off the charts good. Blazing leads, technical fills, and sledgehammer riffs are all part of the musical landscape here. As always, the vocals of Hernan "Eddie" Hermida are going to be a hit or miss with some, as he spews out a wide assortment of screams, grunts, growls, bellows, barks, and shrieks. At times he's a tad over the top, but considering the frantic nature of the All Shall Perish sound, he blends in just fine. Some of the tracks do have that 'samey' feel to them, but there's no denying the immense 'intenseness' going on here, thanks to some truly brutal and breathtaking guitar work and drumming happening throughout these 10 songs. Enter at your own risk, but be prepared for a wild ride!